With original late-'70s Op-Amp Big Muffs commanding exorbitant prices, Mike Matthews decided to take the power to the people and reissue the classic pedal at a price that players could afford! 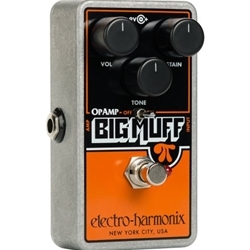 The circuitry of the Op-Amp Big Muff sometimes also referred to as the IC or V4 Big Muff has been faithfully re-created while several practical enhancements have been added including a compact, die-cast chassis and true bypass switching. The pedal relies on op-amps rather than transistors and three gain stages rather than four to create its signature sound. The original Op-Amp Big Muff has many devotees including Billy Corgan, who made use of it extensively on the Smashing Pumpkins’ 1993 album Siamese Dream. After playing the new reissue, Billy said:“The magic's still in the box; I can still get what I’'m looking for!